An Egyptian-brokered ceasefire between Israel and Palestinian militant groups took effect on Wednesday, putting an end to a brief yet intense flare-up. The truce, announced Tuesday by Palestinian militant groups in the Gaza Strip, came after nearly two days of heavy shelling from both sides that had threatened to descend into full-blown war. Gaza's Islamist rulers Hamas said they would abide by the ceasefire as long as Israel did the same. Israeli Prime Minister Benjamin Netanyahu and the military did not comment, but the Home Front Command removed late Tuesday all limitations on southern residents, sending children back to school after two days in shelters. Hardline Defence Minister Avigdor Lieberman, who said on Tuesday he did not support stopping the strikes, announced he will be making a statement on Wednesday afternoon. The latest violence, which saw seven Gazans killed in 24 hours as the Israeli aerial bombardment flattened buildings and sent fireballs and plumes of smoke into the sky, was the worst between Israel and Palestinian militants since a 2014 war. Sirens began sounding in southern Israel late Sunday, sending tens of thousands running for cover in shelters as around 460 rockets and mortar rounds were fired from Gaza, wounding 27 people, including three severely. A Palestinian labourer from the occupied West Bank was killed when a rocket hit a building in the Israeli city of Ashkelon. In a statement issued late Tuesday, Egypt called on Israel to cease its "military action" in Gaza. "Egypt's efforts have been able to achieve a ceasefire between the resistance and the Zionist enemy," the Gaza groups said. The flare-up began on Sunday with a botched Israeli special forces operation inside the Gaza Strip that turned deadly and prompted Hamas to vow revenge. The clash that resulted from the blown covert operation killed seven Palestinian militants, including a local Hamas military commander, as well as an Israeli army officer. Palestinian militants responded with rocket and mortar fire, as well as an anti-tank missile that hit a bus Hamas says was being used by Israeli soldiers. A soldier was severely wounded in the attack. Schools were closed in Gaza and in southern Israel on Tuesday as the two sides warned each other they would respond forcefully to any further violence. Egypt has negotiated ceasefires following previous flare-ups, while UN Middle East envoy Nickolay Mladenov has also been seeking a long-term truce in recent weeks. After an Israeli security cabinet meeting that reportedly lasted some six hours on Tuesday, a statement was issued saying the ministers "instructed the (military) to continue its operations as necessary". Missile defences intercepted more than 100 rockets from Gaza and most others fell in open areas, though some hit houses and other civilian structures. "Within two seconds (after air sirens) we heard a huge boom, we saw our curtains flying in the air, windows (broken), and only after a few minutes when we went out, we realised that the missile had hit the building next to us," one man who lives near a block of flats hit by a rocket in Ashkelon said on Tuesday. Israel hit back with major air strikes, with targets including Hamas's Al-Aqsa TV station and internal security headquarters in Gaza City. The military said it struck some 160 targets in the enclave. "What happened was like an earthquake," said Abu Ayman Lemzeni, who lives near the targeted TV building. 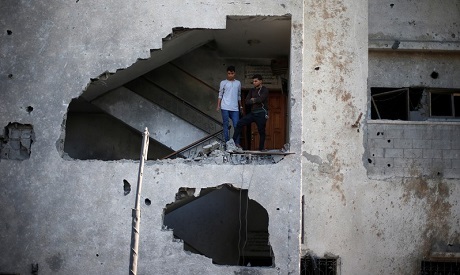 At least five of the dead in Gaza were claimed as members of various militant groups. Some 26 other people were wounded in the Palestinian territory, according to Gaza's health ministry. The escalation came despite Netanyahu's decision to allow Qatar to transfer millions of dollars in aid to Gaza for salaries as well as fuel to ease an electricity shortage. The agreements had led to calmer protests along the Gaza border after months of deadly unrest. Sunday's special forces operation and resulting clash upset those efforts, leading to questions over the timing of the covert Israeli move. Israel said it was an intelligence-gathering operation and that those efforts must continue to defend the country. Israel launched three wars on Gaza since 2008, and protests and clashes along the Gaza border since March 30 have repeatedly raised fears of a fourth. At least 234 Palestinians in Gaza have since been killed by Israeli fire, the majority during protests and clashes. *This story was edited by Ahram Online.